Thank you for actively seeking to improve your best friend’s quality of life by searching for the best low protein dog food for liver disease. We you for taking this extra step! Here are 4 liver-friendly dog foods to consider (and why). This food contains primarily vegetable protein, which their website suggests is better and easily digestible for dogs with liver disorders. If you have any doubts, you have to check out the customer reviews! They also say that there are low copper levels, as well as a “high energy” content. So take that any way you want, but they claim these “high energy” ingredients allow picky eaters to eat less and more frequently. So it might come in handy if your dog suffers from frequent lack of appetite. Royal Canin also offers a sister product to their dry kibble. Their canned food boasts the same benefits as the kibble but may be just a bit tastier. Like mentioned above, it might be useful to mix things up in order to keep Lola interested in eating, as some dogs with liver disease experience dramatic decreases in appetite. Reviewers call this dog food, and I quote, a “miracle”, with others saying things like “this product probably saved our puppy”. 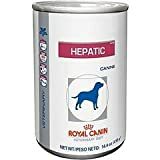 According to their website, Hill’s claims that this dry dog food helps reduce liver workload, maintains normal fat metabolism in the liver, provides nutrients to avoid liver-related deficiencies, and supports a healthy immune system. They state that their food has moderate levels of high quality protein and low levels of copper. Almost all reviewers note at least some improvement in their dog’s condition after eating this food. No one wants to hear that their loving companion has a life-threatening illness. Unfortunately for some of us, our four-legged friends have developed complicated conditions that are often fatal. One disease in dogs that is especially scary is liver disease. While not always fatal, the condition can lead your dog to suffer, and no one wants that. If you’re here, you’re probably a bit curious about this condition, or perhaps you’re looking for the best ways to treat your dog (or if you’re like me, you got lost in the internet abyss; the last thing you remember searching for was a good tiramisu recipe and now you’re here, but I digress). I’ve looked at some of the best things you can do for your pet in terms of diet, but before we get there, let’s explore the disease a little more. The best way to fight any disease is to first understand it. So open up your brains and prepare to soak up some knowledge. So What does a Dog’s Liver Do? 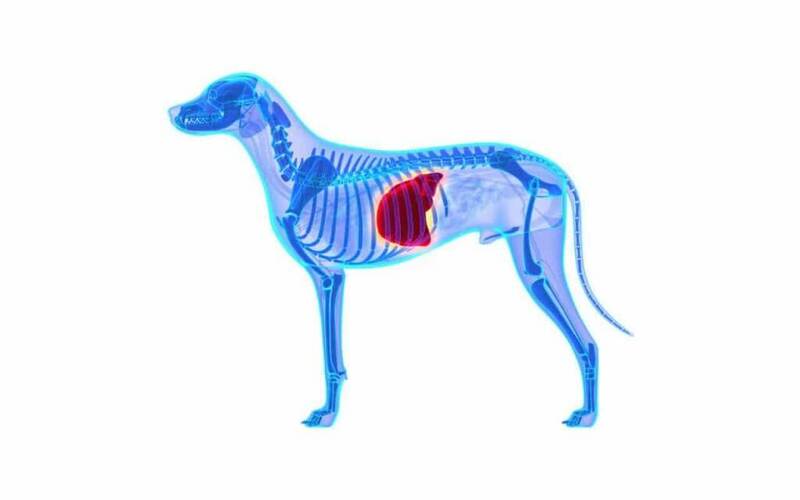 Your dog’s liver is located in his abdomen, just beneath the base of the rib cage (that glowing red thing in the image above). His liver is responsible for some pretty complex and vital functions in his body. The liver helps to detoxify some of the waste that enters his system, such as drugs, poisons or other toxins. It is essential when it comes to blood clotting factors, so when Dottie scrapes her paw or you clip her nail too short (again!? Really!? ), her liver comes to the rescue. The liver also plays a big part in digesting components of their food, such as fats, carbohydrates, and proteins. If your dog is diagnosed with liver disease, their liver cells can start to die. Those dead cells are replaced by scar tissue that makes the liver large and rubbery. After a time, if the disease progresses, the liver could become cirrhotic, which is a terminal condition. There’s not one single thing that causes liver disease. There are some things that are completely out of your control, such as aging and genetics. Older dogs are typically more susceptible to liver disease, and specific breeds of dogs are also at risk. Dobermans, Rottweilers, Yorkshire Terriers and Cocker Spaniels are genetically prone to liver problems, and Doberman Pinschers (particularly females) can sometimes inherit chronic hepatitis. Other breeds that have trouble excreting copper (which can lead to copper-associated hepatitis) are Bedlingtons and West Highland White Terriers. Basically, if a dog takes too high a dosage of a particular medication or takes a specific medication for too long, it might result in liver disease. Cancer can also be an origin for the disease, as well as trauma to the area. What are the Symptoms of Liver Disease in Dogs? They could have something else going on. The point is, if you notice these symptoms, something is going on, and your best bet is to get to the vet. How to Prevent Dog Liver Disease? Like I mentioned above, things such as genetics or aging are of course, not preventable. There’s no fountain of youth for us, and unfortunately the same applies to our loyal cohorts. A part of getting older means dogs (and you, comparatively) will experience a decline in overall system function. Also, as mentioned above, infectious diseases can be a source for liver disease. Therefore, it’s important to take your dog to the vet when they are sick and receive prompt and effective care for their illness. Also pay regular visits to your local vet and get a checkup (not you, the dog). There are some routine blood tests that can measure the health of your dog’s liver. There are some natural toxins that are found in plants, and there are of course harmful chemicals kept directly in your home. Restrict Max’s access to these dangerous areas, and be sure he’s not playing too hard, or at least not as hard as to damage his internal organs (that would be some pretty intense playtime). But before you go around bubble-wrapping sharp corners, putting cleaning supplies in the attic, or throwing away that questionable houseplant you got as a gift, just relax. As long as you keep a good eye on your dog and are conscious of what to look for, you’ll be fine. The easiest thing you can do to keep your dog’s liver healthy is to give them a healthy lifestyle. Feed them good foods (but not too much!) and make sure they get a proper amount of exercise. Remember, the best defense is good preparation. What Can We Do to Treat Dog Liver Disease? If liver disease is treated before becoming cirrhotic (enters the cirrhosis phase), enough liver tissue may be regenerated to allow the liver to function normally. If not, the disease is terminal. Treating liver disease however, is complex and variable. Your specific method of treatment should be put in place by your veterinarian, not this article. You’ve read about how many different causes of liver disease there are, so it’s logical to assume the treatments vary just as much, if not more. Your veterinarian may prescribe medication and vitamins for your pup and they might also make some suggestions about their diet. Dogs who have liver disease need a very specific diet that’s different from your standard menu lineup. But the thing that’s interesting here is that you have some control in the fight against you dog’s liver disease, so let’s explore it! 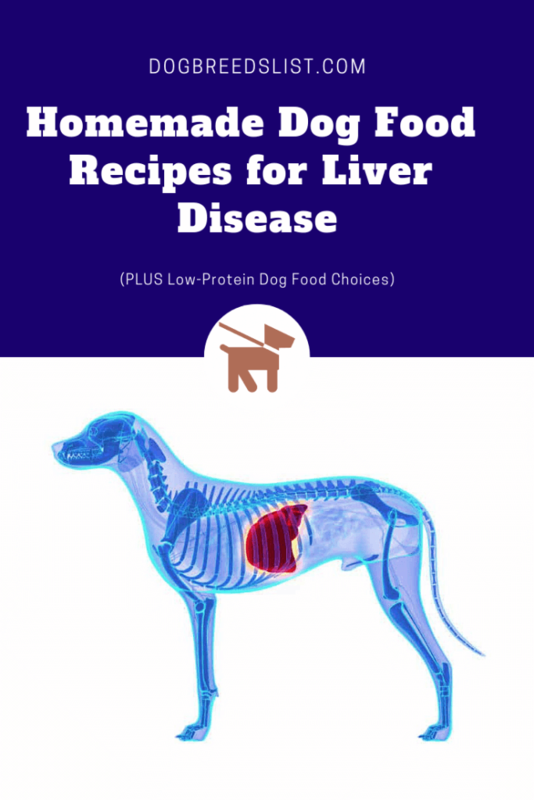 What is the Best Low Protein Dog Food for Liver Disease? When it comes down to it, you basically have two options: keep feeding your dog commercially available food, or put on your apron and chef’s hat and start making poor little Snoopy his own, homemade meals. Regular dog food is not recommended for dogs with liver disease, as they contain different types of protein that may elevate ammonia levels and contain excess carbohydrates that they don’t need. They also may not have the necessary vitamins and minerals that are essential to liver health. If you want to go the commercial dog food route, you’ll need to get liver disease-specific food. There aren’t many foods on the market that are trusted and effective, but there are two brands that I frequently came across when researching this topic. Perhaps one of the most popular solutions to the diet problem in liver disease stricken dogs is the homemade option. That’s right, let’s get cooking. Don’t go banging around in the cupboards looking for pots and scrambling to thaw that ground beef just yet. Take a moment to consider what your dog needs. Remember, they need high quality and easily digestible protein. You may be surprised that some of the best non-meat protein sources for dogs with liver conditions are actually found in dairy products and eggs, with eggs being the standalone champion. The reason is because the protein found in these foods produce less ammonia as they’re digested in your dog’s belly. Ammonia is known to strain the liver, which your dog definitely does not need. There are also some liver conditions that are caused or worsened by the addition of copper to your dog’s food. So it’s widely stated that your dog should avoid consuming too much copper. Some commonly accepted forms of food that have both of these qualities are turkey, chicken, white fish, beef, eggs, and cheese. There are plenty of websites out there with easy recipes you can make for your dog. Some people swear by making dogs homemade meals with some even crediting them to saving their dog’s life. I’m not a Mother Earth-loving, hemp shirt-wearing, kale chip-eating hippie. A dog is a dog and they eat kibble. I can’t even make myself scrambled eggs. I’m just going to get the Hill’s stuff. You can prepare meals in advance and freeze them, or you can feed your dog a little of both the kibble and homemade food (But try to maintain the same pattern. Dramatic shifts in what you feed your dog can cause separate health issues). I’m suffering you fool. Make me some eggs or mash up some yams. I’ve been your friend for 10 years! It’s the least you can do. Please, that ‘high-energy’ kibble tastes like cardboard. Before you know it, you’ll be in the kitchen with a meat stained apron, Buddy will be covered in flour, and you’ll have a freezer full of pre-made meals that he will thank you for. Luckily for you, I’ve included a few easy recipes to get you started. We’re not talking fancy meals here, so don’t start getting nervous on me. 3 Recipe Bundle – These recipes are more homeopathic – if you’re into that. The creator is a self-declared herbalist for humans who now provides recipes for dogs with not only liver conditions, but also heart and kidney conditions. She gives three recipes here, with two recipes that have raw ingredients. Miracle Diet – This one is a bit interesting for me. Don’t let the atrocious web design fool you. Once I read through little Sunny’s story, I felt inspired to add this homemade section to the article. Sunny’s condition was extremely severe, so this is a suggestion for severely sick dogs. It’s probably too late, but…do yourself a favor and don’t click the links at the top of her article because it will take you to an even more atrocious-looking website that talks about Schnauzers. Just scroll down to read Sunny’s story. I hope you read this article to get ideas of how to best prevent liver disease in your dog. However, if your dog was unfortunate enough to be diagnosed, I hope it was caught in the early stages and can be remedied or managed with a little tender loving care. For those of you with dogs who have cirrhotic livers and terminal diagnoses, I first and foremost say sorry. As if it’s not enough that we have to deal with terminal illnesses in the humans we love, we also have to watch our loyal pets suffer through them as well. I hope some of this information gives you a few more months or years with your four-legged friend. Does your dog suffer from liver disease? Do you have any tips or tricks that may be useful for other owners grappling with the same issues? Please leave a comment below about your personal experiences or recipes that may have created a little “miracle” for you.